Kris is back with his semi annual report on the state of Palm's retail presence in the US. In his latest report, Kris ventures out to the local Best Buy and a Sprint Store to checkout Palm's latest offerings and current product presence in the brick and mortar space. While accessories don't make or break a company's fortunes, first-party accessories are a nice way to pad the corporate coffers while bolstering a firm's branding and visible retail presence. Approximately five months after the retail launch of the Pre, retail giant Best Buy have finally begun stocking a full line of Palm-branded Pre and Pixi accessories. Interestingly, Best Buy's prices for the Touchstone cradle and the Pre Leather Side Case are $5 below Palm's MSRP and web store pricing. The Palm AC and vehicle chargers remain at the standard $29.99 price points. No sign as of yet for Pixi-specific Palm accessories at Best Buy such as battery doors or cases but as of last week they were stocking a few 3rd-party Pixi snap-on cover cases. In what is a turn of events surprising to absolutely no one, the last remaining vestiges of the Palm OS era are being rapidly phased out but stocks are still available for one final Garnet upgrade if you act quickly. The Centro has disappeared from the front page of Palm.com, though by searching the site, you can still work your way to the Centro product page with links to purchasing the device from all three domestic carriers. In addition, unlocked GSM Centros are still available in white, red, and blue for $199.99 making it arguably the best (and likely final) deal ever on an unlocked Palm smartphone. Sprint also still offers the Palm Centro (Wasabi Green only in my zip) for $29.99 after rebate for new contracts or renewals on their webstore, with the classic Treo 755p still surprisingly available in blue for $99.99 after rebate, which is the same effective price point as the newly-released WebOS-based Pixi. For those that prefer the instant gratification of a brick & mortar retail experience, a handful of Best Buy and Sprint stores surprisingly still have Centro stocks available. A recent trip to several local Best Buy stores had a few Verizon and black AT&T Centros available for "free" with contract, though a subsequent follow-up visit revealed that the AT&T Centro had disappeared. Pink Sprint 128mb Centros were still available at least at one store as of Black Friday weekend. Finally, I can confirm the reports of other PIC readers that some Best Buy stores have Palm "Athena" MultiConnector accessories on clearance. Last week I spotted a RocketFish USB Sync/Charge Cable for MultiConnector Palm devices on clearance for $4.99 (also available for purchase online) alongside a Palm-branded MultiConnector vehicle charger for $5.99. 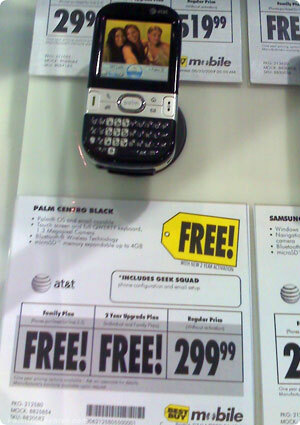 If Palm had put out an unlocked Centro at $199 at this time last year, I would have probably pounced on it and never bought my T-Mobile G1. 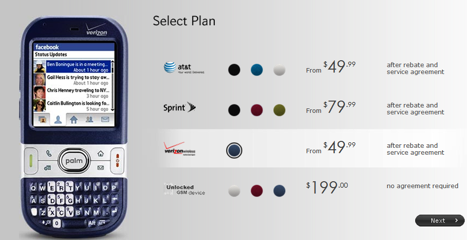 A shame Palm never released a "special edition" or Centro 2 running Garnet in GSM & Verizon flavors. All they needed to do was the 128mb RAM + soft touch paint from the red/green Sprint holiday editions from last year + latest version of PTunes Deluxe + DTG in ROM + a Seidio 1350mAh extended battery (Palm-branded, of course) and it would've been a winner. And if on top of that they had swapped out the 2.5mm jack for a 3.5mm one...wow! I would've probably bought two! P.S. IIRC the unlocked Centro was available last year around this time for $299ish but only in white. a 480x320 Centro would have been nice as a swan song.